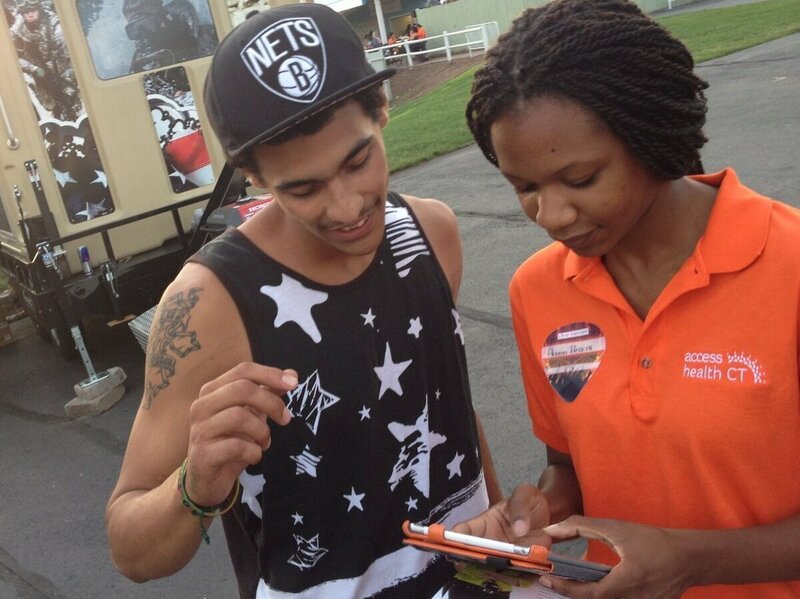 Outreach worker Emanuela Cebert (right) talks to Papilon Ferreiras about health insurance outside a rap concert. All across Connecticut, you can see billboards and TV ads, hear radio spots and get pamphlets about how to get insurance under the new health care law starting Oct. 1. But the state is also using less traditional, and more expensive, ways to get the word out. At state beaches this summer, outreach workers handed out tubes of sunscreen that said, "Get Covered." The state is opening up Apple-like storefronts. And outreach workers have fanned across the state to talk with people attending fairs and shows, like the America's Most Wanted rap concert featuring superstars Lil Wayne and T.I. Papilon Ferreiras, 21, was at the concert. He says he works about 35 hours a week at Taco Bell and would like health insurance. "Who wouldn't? Who wouldn't like health insurance?" he says. This is where Emanuela Cebert, an outreach worker, sees an opening. She walks up to Ferreiras, tablet computer in hand. "If I had a way for you to get more affordable health insurance or health insurance in general, would you want to learn more about it?" she asks. "I'll look into it. Not today. But I'll look into it," Ferreiras answers. So Cebert tells him she can get his information and contact him in October, when Connecticut's marketplace starts selling insurance under the Affordable Care Act. The state has a lot riding on how Ferreiras and others respond. "This is the biggest expansion of health insurance in 50 years," says Kevin Counihan, executive director of Access Health CT, the state's health care exchange. He's got $15 million in federal money to spend on marketing. "It's pretty hard to communicate effectively without investing some," he says. "We invested in a lot of other programs in order to promote them." 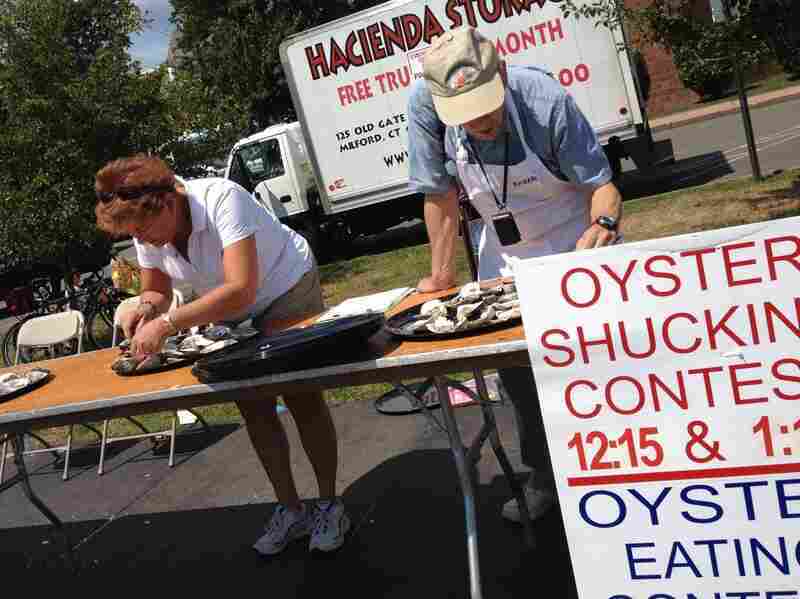 Connecticut's health exchange sent outreach workers to the Milford Oyster Festival to get people to sign up for health insurance. The outreach is heating up now, even though people can't officially sign up until October. Coverage begins in January. Connecticut is one of 16 states and the District of Columbia setting up their own health insurance marketplaces. Under the Affordable Care Act, they get access to federal marketing money. The outreach work isn't easy. People often people walk right by Cebert and her colleagues. But if the health care expansion is going to survive, successful outreach is important. "We're gonna be at Miranda Lambert and Dierks Bentley," Counihan says. "We're going to be at the Rockstar Energy Drink Uproar Festival. We're going to be at John Mayer and Phillip Phillips." It's about more than raw numbers. It's about the particulars of who signs up. "It has to be broad and comprehensive," he continues. "If we narrowed this, say, to the Hartford Pops Festival, or the Hartford Jazz Festival, we will get a slim demographic which doesn't adequately reflect our state." A few weeks later, Counihan's workers were at the Milford Oyster Festival and its shucking competition. The goal was to reach an older, more suburban crowd. Robert Harrington was there. He says he could get health insurance through his job, but he doesn't. It's too expensive, and he makes a calculation. "At $100 a week. You know, do I pay health insurance [or] do my kids eat?" he asks. Now, he doesn't have much of a choice. He doesn't like President Obama, and he doesn't like Obamacare. But he doesn't want to be penalized for being uninsured. "You know, I got to do what I got to do. I don't want to get fined. 'Cause it's a tax!" he says. And then there's Gary Mott. He's a bathtub refinisher with insurance, but he worries about the $10,000 deductible for his and his wife's policy. "For both of us altogether it's about $450 so we're good right now, as far as premiums go," he says. "But that deductible, if one or both of us gets sick we're in trouble. That's how people end up losing their homes and such." So Mott could be one of the people who finds an option in Connecticut's marketplace. Exchange head Counihan says he's hoping to enroll about 100,000 people in the first year alone. This piece is part of a collaboration among NPR, WNPR and Kaiser Health News.